Minnesota (and several other states) has legal requirements to secure firearms and ammunition from children under the age of 18. This means that guns and ammo have to be locked up in a reasonable fashion. We participate in professional firearms training about ten times a year, with trips to the range, “bonus events” and check-out shoots added for good measure. This means that we need to store more than a box or two of ammunition. 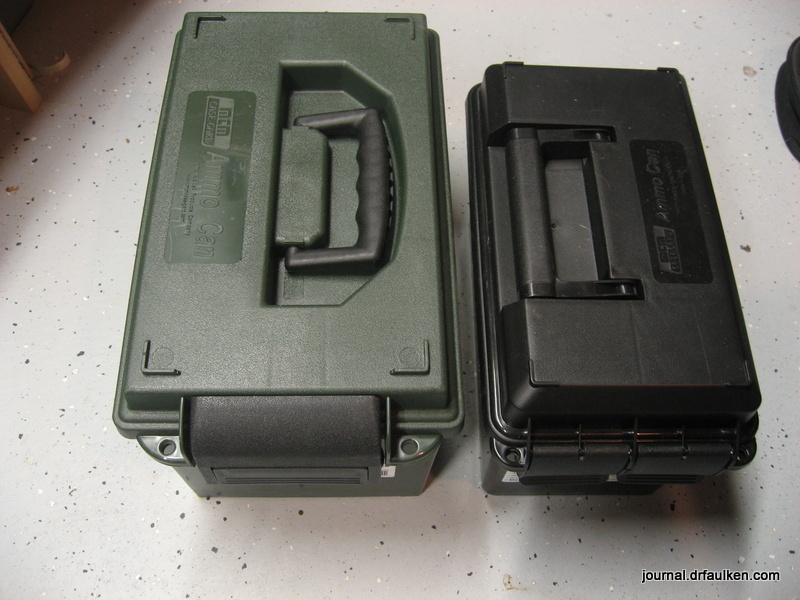 In 2011 I wrote about .50 caliber plastic lockable ammo storage cans made by MTM Case-Gard. I needed some more, and I turned to Amazon again. I ordered a beefier model by accident, and I want to talk about the pros and cons of the AC11 heavy duty plastic lockable storage can. The heavy duty AC11 is on the left. The black AC50 is identical to the one I reviewed in 2011 except for the color. The AC11 is bigger, more sturdy, and holds more than the AC50 I purchased previously. Oddly, it’s very close in price to the AC50 — or at least it was on Amazon when I bought them. The AC11 cost about $18 shipped, which I think is a good deal. The AC50 is about $13 – $16 depending on availability. The AC11 claims to hold either 20 or 30 pounds, depending if you believe the Web site or the product information label on the can itself. I put in a 40 pound brick of ammunition and it held up just fine. This is a marked improvement over the AC50, which has troubles with heavier loads due to handle design. 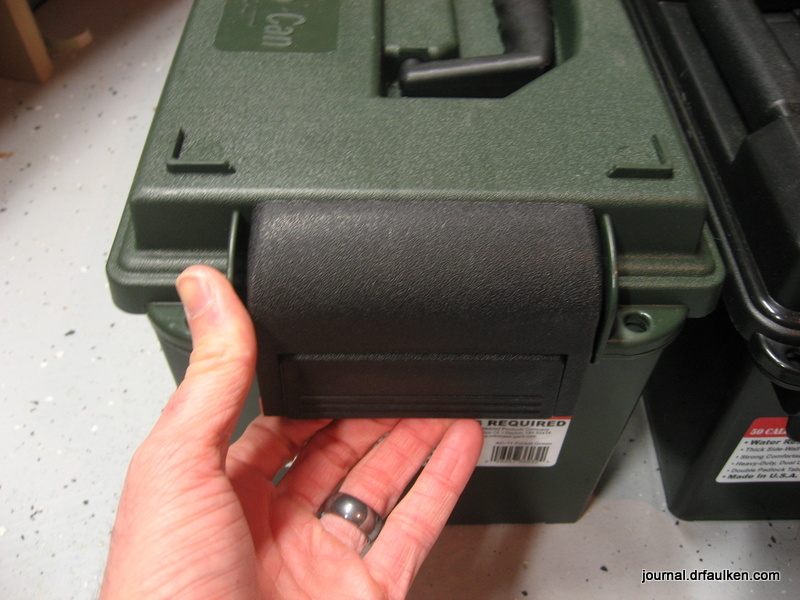 The AC11 has two locking points on the front of the ammo box. 30mm shank padlocks work great. Aside from the much larger size, the AC11 has a different handle design. This is critical, and why it can hold more weight than the AC50. I wish the AC50 had this handle design. The AC50 handle is kind of shaped like a “C.” The ends of the “C”-shaped handle go into holes in the lid of the can. The handle will pop out when under heavy load. 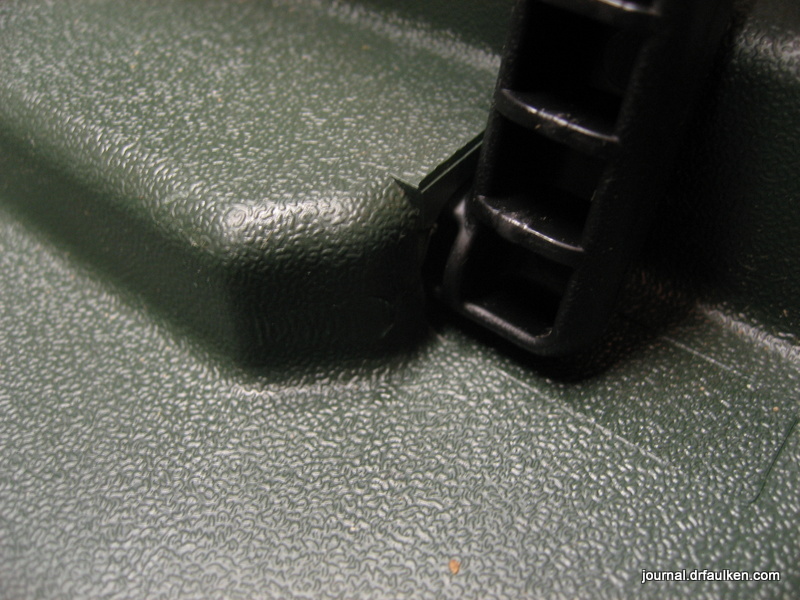 The AC11 handle is way more robust and is inserted farther into the lid. 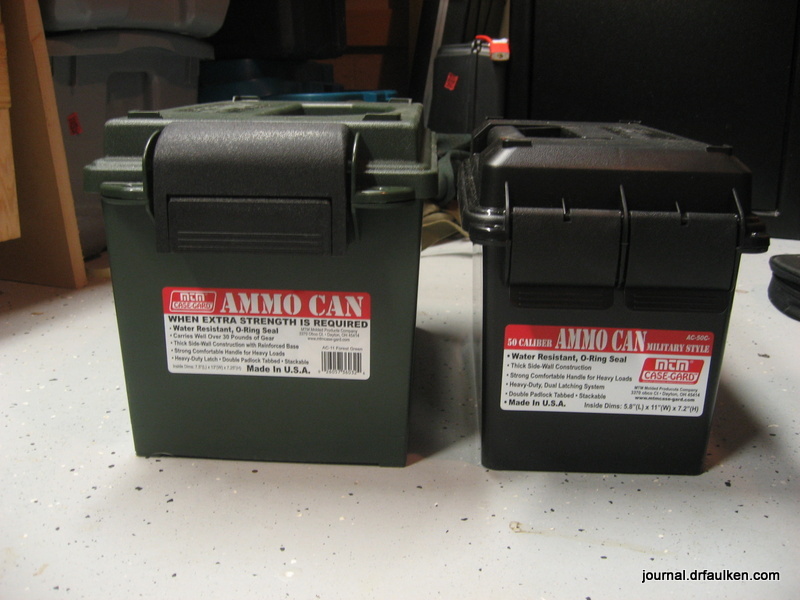 I was able to load the can with a case of 7.62x39mm ammunition, something I would not have dared to try in an MTM AC50. Another difference is the lid latch. The AC50 has two smaller, weaker latches that just snap upwards. 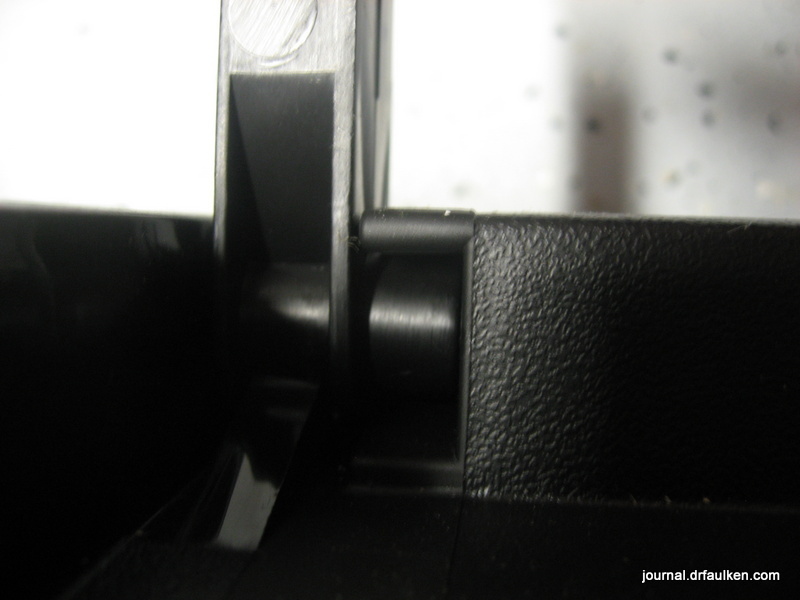 The AC11 has a pull latch on a hinge. I’m not sure how to properly describe this, but the top of the AC11 latch hooks over the top of the lid and then snaps down into place. It’s much sturdier. However, all this beasty robustness comes at a price. It’s taller and wider, and frankly I don’t need the added capacity compared to the AC50. I stack my ammo cans two deep on a reinforced shelf under my workbench. I can fit 5 columns of AC50 cans two deep per workbench section, for a total of 10 cans per section. I can only fit 8 AC11 cans, and they protrude about four inches beyond the workbench. I’ve bumped the AC11s a few times with my shin. It doesn’t hurt, but it’s just weird having them stick out so far. I think the additional capacity of the AC11 will go unused for those who cart their cans back and forth. I could probably put 1500 rounds of boxed 7.62x39mm in the can depending on how well my Ammo Tetris game is that day. That would equate to about sixty pounds of ammunition. While I can definitely carry that much, it’s two to three times the stated limit of the can’s capacity. I have no idea how many rounds of 22LR I could fit in the AC11, but it eats all of my inventory with ease. I wouldn’t want to cart my entire assortment of ammunition with me to the range, so the added capacity doesn’t really apply to me. I guess if you want static storage the AC11 is a good solution. I wish the AC50 had the handle design of the AC11. Then it would be the perfect plastic storage can for me. That being said, the AC11 is a big improvement in the build quality department. At around $3 – $7 more than the AC50 you may just spring for the larger can. Also, your particular storage situation may not be like mine, and you may not care about the additional footprint of the MTM behemoth. As a (hopefully) temporary aside, the price on the AC11 has tripled on Amazon since I bought mine. I assume this is a momentary douchebag move by a single seller while the rest of the supplier restock. Hopefully the can will drop below $20 again soon. I’m providing a link just in case.